Hey Roadies! We're pretty excited about our exclusive stamp sets that are part of the Maya Road Classic Card Kits. They are designed in classic Maya Road style and you'll find a myriad of ways to use them. Each exclusive stamp set is designed to give you lots of stamping and design options whether you stamp simply or enjoy techniques. Today we have a cute stamped card by Julia Stainton. It features a collage of stamped images from the Autumn Notes Kit and some sweet embellishments. To create a stamped collage, a good place to start is with the largest image you wish to stamp. Stamp this image and then start adding in your other images. To make each image stand out you can use different colored inks that create your color scheme. Julia's color scheme was inspired by a strip of our Maya Road fabric tape included in the kit. Another fun and easy detail is the punched notch on the right side of the card. Simply punch out a semi-circle from the card front edge using a circle punch. Use a slightly smaller circle punch to punch a red circle using patterned paper from the kit. Adhere to the inside layer and staple to add to the office look. Hey Roadies! Today we have a sweet Autumn Card to share with you. 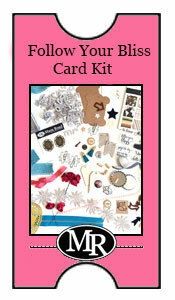 At Maya Road Classic Card Kits we like to inspire you with different cards you can make with our kits. Each kit offers a multitude of ideas. You can check out our galleries for inspiration or simply let your creativity go wild and create whatever you like. This card by Julia Stainton is warm and inviting and perfect for fall. It can be put together quickly using the Autumn Notes kit contents and a few tools you may have on hand. If you have a couple circle punches, some sandpaper and a stapler (optional) you are all set to create this card. We especially love the focal point of the design. Our custom flair looks so pretty as a flower center and doubles as the sentiment. To create this floral accent, adhere the layerable kraft flowers over each other and add the flair in the center. Texture seems to be a predominent theme in fall projects and the jute twine found in the kit really adds it to the design. Hold two fingers together and wrap your twine around them until you have desired fullness. Place a dab of hot glue or other adhesive at one section of the design to hold all the wraps of twine together. Tie the jute ends and then adhere around the flair. Creating the flower petals is simple with a large circle punch. The punch used here was approximately 2 inches in diameter. Simply punch out the circle, the place it back into the punch 1/3 to 1/2 of the way in. Punch our your leaf shape and sand the edges for definition. You'll be able to get two leaves for each punched circle you make. Have fun creating with your Autumn Notes Classic Card Kit! It's our very first Maya Road Classic Card Kit release! Welcome! We hope you are as excited as we are because October's kit Autumn Notes is perfect for the season as well as all through the year. All our kits are limited edition so if you want it, make sure you purchase it right away. Quantities are limited. The Autumn Notes kit brings to mind fall, back to school, thankfulness, & staying in touch, all with a fun office theme. We know you'll love this kit with it's classic colors, beautiful embellishments and everything you need to create 6 cards and more. 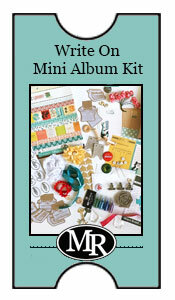 Envelopes, papers, trims, stamps and fun exclusives make it easy to just open the package and get creating. We think you'll agree that's quite the list of awesomeness and value! Maya Road Classic Card Kits are a great way to sample a variety of fabulous product and those special extras you won't find anywhere else. If you've been following the Maya Road Classic Card Kits blog over the past few days, you'll find some great card samples of what you can create with this kit. We also have an Autumn Notes Kit Sample Gallery for more inspiration. Check it out here! Our Autumn Notes Kit Add-ons. At Maya Road we think you can never have too many trinket pins and flair. Don't you agree? Included in this add-on package is one complete package of Yellow and Turquoise Star Pins (that's 50 beautiful trinket pins!) and 2 custom flair pieces. How adorable are these sweet spools of trims and twine?! With this add-on you get three darling wooden spools each wrapped with coordinating Maya Road trims and twine. There is one yard each of turquoise seam binding and twine cording and 30" of the chocolate plum tape measure trim. Join us on our creative journey with the new Maya Road Classic Card Kits and our first release, Autumn Notes.